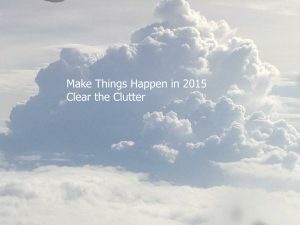 Clearing Clutter Now Save Heartache and Headache Later! Ever noticed how much more spacious your room looks once all the Christmas stuff has been removed? When I noticed this, it inspired me not to put back all the ornaments I had previously removed to make the house look festive. Instead, I became ruthless and got rid of a lot of stuff. It started with the Christmas storage boxes. I removed the broken and no longer fashionable or wanted decorations from the boxes. The result is I now have 4 boxes instead of 6 – progress! My desire is to de-clutter the whole house. I even cleared out the space where I stored the Christmas boxes. By the time I finished, I had cleared off several shelves in the old bookcase we had put there for additional storage. I was then able to move the extra books that were cluttering up my office space. These were novels that I had read and just knew I wouldn’t reread them, so I put these on the newly vacated shelves, not to keep mind. I would pass along to friends or check if the local church could sell them at their next bazaar. I adore books which is why I have four bookshelves full of books in my office space. I often pick one up for inspiration for writing when I get stuck. Now that the additional books (they were stacked double on the shelves so I could no longer see the books behind them) had been put away, everything in the office looked clear and spacious once more. It felt so good, hard to believe what an amazing feeling organizing can be. Christmas was now neatly stored away and my office too was clutter free. I felt more expansive as well with this good feeling – accomplishment. Alas my free time I had given myself over the weekend was at an end and the week was about to begin. I would need to schedule in time in the coming weeks to continue my purging. It wasn’t just the putting away of Christmas that had me spurred on and charged me up about getting rid of stuff – no I was indeed doing it for my family. Why, what would happen to all the stuff, who would sort it, cherish it, want it, remember it the way my husband and I did? You see we do plan eventually to downsize once our home and gardens get too much for us to handle. So why not start now? It was the thoughts of how all our stuff would make our children feel as they sorted it and got rid of our life when we eventually die? I had recently gone through this exercise with my sister and daughter as we emptied out my parent’s apartment. Mum’s memory had gotten worse and she was now in a senior’s residence. Most of dad’s life had been removed when he died but there were still lots there to tug at the heart strings, his music book, art supplies for instance as well as special dishes mum had loved and were meant to be treasured – well these came home with us. We had two weeks to clear it out. It was hard, so many memories, what to keep, what to sell, was on our minds. Mum was able to take quite a bit with her which was great but there was still so much other stuff. I lost count of the times my sister and I went to the garbage chute with bags of stuff. Mementos, odd photos of friends we had never met or places that meant nothing other than captured moments of time in their lives – these certainly had no sentiments for us. In the end, if I didn’t want a home filled with all this – out it had to go. It was either now or later when we too no longer cared or were deceased. It would mean even less to our children. It is also difficult for a child even though they may be adults to go though their parent’s belongings. There seems to be a sacredness, a vulnerability at seeing it all. Exposing them and reducing their lives to stuff, to memories and photos. As it was so hard on us, I am starting to clear out now. I hope not to continue to collect more. I have a new rule, if I get a new one, then the old has to go – no more “I’ll keep it just in case”. The same goes for my closets, if I have not worn it in 2 years – out to charities that can sell it to fund what they truly need. We certainly can’t take it with us so enjoy it now and then pass it along. Stop the attachments and need to hoard. This is the clarity I received from my exercise this weekend. Think of those, our family and children who will have to clear it up for us. Perhaps payback time for all the times we picked up and cleaned up their room! I have chosen to make it easier for them. I’ll do it while I’m still living. This will save them heartache and headaches of doing it later.